On the secondary market, according to TicketIQ.com, the average asking price for Capitals tickets for the second round at Capital One Arena is more than 67 percent higher than the cost of a first-round ticket. The average asking price is $338 for their playoff series against the Pittsburgh Penguins. This will be the third straight year the two teams have faced each other in the Stanley Cup playoffs. Washington lost in seven games in the second round last year and in six games in 2016. In fact, the Pens own the post-season series, winning nine of 10 meetings. 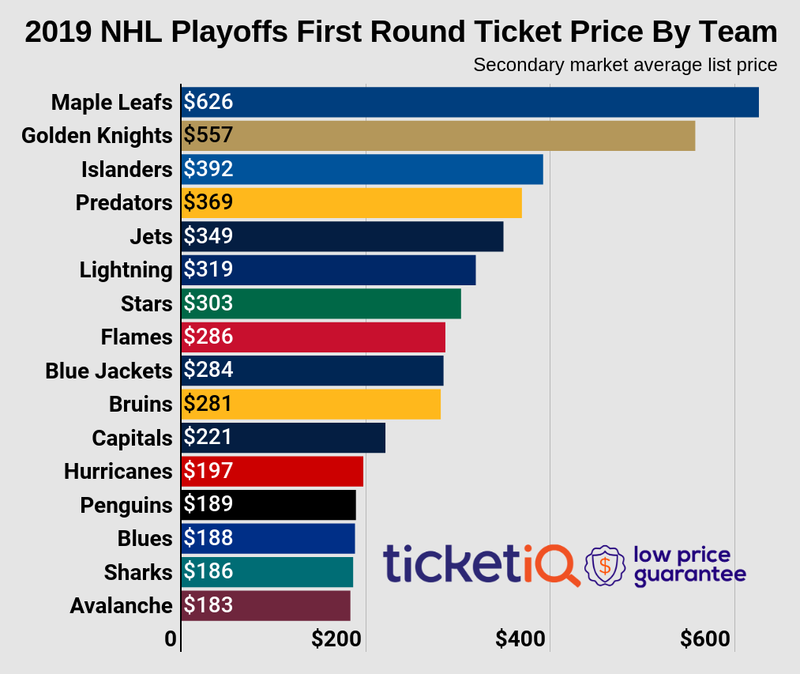 However, these are the least expensive of all second round teams and historically the cost to get into a Capitals game during this round is the second lowest since TicketIQ began tracking data in 2011. The cheapest second-round ticket was $197 in 2015 and the most expensive was $558 last year. The Caps are the host this time around and could potentially play four games at home. So far, the highest asking price on the secondary market is for an if-needed Game 7, for which the current price is $511. The cheapest game is Game 1 at $177, with Game 2 at $239 and an if-needed Game 5 at $426. The get-in price on the secondary market ranges from $67 for today’s game to $411 for Game 7, which also has the fewest tickets (8) left available on the market. The average asking price for the series as a whole is $291, and it will cost fans less to see the Eastern Conference Semifinals in Pittsburgh, where the average asking price is $229. The Caps have not advanced past the second round of the playoffs since losing in the Stanley Cup Finals to Detroit in 1997-98. Washington has never won a Stanley Cup. The Washington Capitals have made it to the Stanley Cup playoffs for 10 of the last 11 years. But in that span, the team hasn’t won more than a single series in the playoffs. Are fans tiring of postseason mediocrity? According to data from TicketIQ.com, the answer is yes. With the first round of the postseason just a day away, the average asking price for a Capitals ticket is the lowest it’s been in a decade -- $203 – and it’s the third cheapest across the NHL. Washington will host the Columbus Blue Jackets on Thursday. Only tickets to see the San Jose Sharks ($161) and Los Angeles Kings ($172) at home for a playoff opener are cheaper. The highest average asking price is $652, to see the Toronto Maple Leafs host the Boston Bruins on Thursday. While it will be cheap to get a seat at the Capitals game, that may not be a bad thing. The lack of interest, or skepticism, of fans may be just what the Caps need. Low expectations often translates into low pressure. Even though Washington won the Metropolitan Division, it had the least number of wins of any team that won its division. The Caps won 49 games, narrowly edging out the second-place Pittsburgh Penguins (47-29-6). All the other division champs won 50 games or more. For Capitals fans that aren’t willing to throw in the towel before the post season even begins, tickets to this year’s playoffs are a great bargain. The get-in price of $42 is the same as last season, when the average asking price was $313. Over the last five years, the next least expensive ticket was in 2015, when prices settled at $209. That year, the Caps advanced to the Conference semifinals where they lost – as they did in 2016 and 2017.